yesterday I copied and pasted a post on facebook about the silent illnesses many live with and the way you really can't understand without personal experience. the post generated varied responses, from naming or hinting at the illnesses people are living with, to remembering that I have lived with some silent pain and illness for much of my life. it is a long time since I reached the point where I had lived half of my life with back pain - thankfully, I don't suffer nearly as much since finding a practitioner of network system analysis, which has helped my body to find healing for itself. I realised this morning that as I turned 34 last week, I have reached the point where I have lived half my life under the cloud of depression. From now on, more of my life will have been woven through with experiences of mental illness than not. Cameron invited me as a Biblical storyteller to come along and, well, tell stories, sharing a bit about storytelling as well. We me upstairs at Jah'z Lounge in Cinema Place in the city - it's a lovely cafe, the staff are friendly, the food was delicious, and right by Palace and Nova cinemas, I recommend it for the dinner part of your next dinner & movie outing. As we gathered, conversations already began to touch on issues and ideas that would be raised through the stories I was going to tell, such as: how do we meet each other in our difference, willing to listen, or assuming our worldview is the correct worldview and everyone else is just burning (in hell?) to hear the Truth we have to offer? I have a bee in my bonnet at the moment, as I've been developing stories for telling, and the words I want to say when I address a dinner this Friday. The kin-dom of God attracts me as a name for God's Way of Love, otherwise named as the kingdom of God/ Heaven. It is a term I read in the poetry of Bruce Sanguin (If Darwin Prayed, 2011). I like it for its direct contrast, swapping a hyphen for the 'g' and turning the focus from a power-protecting king to relationships with kin. One of my favourite concepts from the Hebrew Bible is hesed, in English most accurately translated as lovingkindness - a love that affirms the other in the fulness of their being. It seems to me that Jesus was all about fulness of being, he came that we might have life in all its fulness. There are lines in Lynch's poetry and introit that resonate deeply on first reading, that invite further reflection. I am going to list them here, for my benefit, so I know which ones I want to dwell on. Perhaps they'll entice you, spark your imagination - and I hope they'll invite you to seek out this wonderful collection of poems about an intriguing character. this morning at Belair I told the story of God calling Samuel for the first time. I didn't spend a lot of time preparing this one, so I in some ways I am still sitting with questions I usually work through before I do a telling. Eli responds - 'I did not call, return to bed and lie down.' I haven't quite worked out how much characterisation I want to put into this - you could go over the top and yawn, and do an old man's voice ... as a general rule, I tend not to act too much because the difference between storytellers and actors is that storytellers take on the role of the narrator, actors take on the role of the character. The body is the Temple of the Holy Spirit (v. 19) - the Holy Spirit is within you. The Holy Spirit is therefore within each person we meet (Brown Oden). Holy = set apart (recalling the understanding of the stories in the Hebrew Bible / Old Testament). I remember what we heard from Craig Mitchell in Church Ministry & Sacraments at college: that ordained persons are set apart within the priesthood of all believers, for the good of all, the good of the whole. We have a particular role and function, but are not above, or extra special or outside. 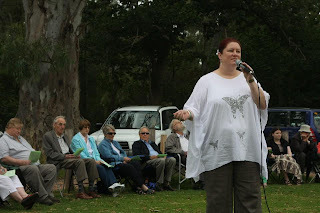 yesterday as part of a joint worship gathering of Blackwood and Belair Uniting Churches, in Belair National Park, I told the story of John the Baptist & Jesus' baptism (Mark 1:4-11). John the baptiser appeared in the wilderness - question of emphasis: if on 'appeared' makes it seem as though he apparated like the witches & wizards from Harry Potter's story; if on 'the wilderness', says something about the history of salvation for the people of Israel, which so often happens in / out of the wilderness. This is a story of salvation, of God's participation in creation for the redemption of God's creation. proclaiming a baptism of repentance for the forgiveness of sins - this feels like a mouthful, and I ask myself, is it a tautology? I think not, for we must turn back to God (repent) in order to enter into the grace (forgiveness) God bestows.